Carl Pedersen was born at Benerud in Eidsvoll, Norway, son of Peder Pettersen and Anne Soffie Jonsdatter. He was baptized and confirmed at the Eidsvoll Church and attended realskole in Eidsvoll. He came from Norway with his parents on the Haakon Adelsten in 1875, arriving in New York on June 24, and then came by train to Sparta, WI where they were met by Lars Anderson and taken to the Cashton area. He worked for a German farmer in the town of Portland and later on a railroad. He also purchased horses in Wisconsin and drove them to Minnesota where he sold them. He went to Goodhue, Minnesota and worked for Martin Bollum, a farmer whose wife had come from Eidsvoll. There he met Gunhild Jorgina (“Gena”) Knutson, whose parents had come from Hallingdal and Numedal, Norway in 1857. In 1880 he purchased some land in the Cleavedahlen area and built a house. 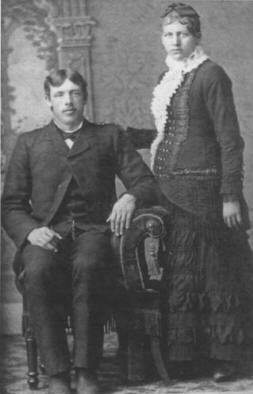 Carl and Gena (1862-1925) were married November 11, 1882 and in 1883 he purchased some additional land from Anton, where they lived until 1886 when they moved to Goodhue, MN. Carl purchased a farm, which he operated the rest of his life except from 1897 to 1899 when he farmed at Red Wing.